Amazon is challenging eBay with pre-owned luxury watches, launched in 2016 and listed on its Amazon Renewed store. And despite the fact eBay has long offered luxury watches in various conditions through third-party sellers, it only added the category to its eBay Authenticate program this September. Amazon vets sellers before they're allowed to participate in Amazon Renewed, formerly called Certified Refurbished by Amazon (see today's Newsflash story). Jewelry has long been a gated category on Amazon, and it added the certified pre-owned watch program in 2016. Because used watches generally don't come with a manufacturer's warranty, Amazon is working with two companies to provide warranties. - For New condition watches that do not come with a manufacturer's warranty, customers will receive a two-year limited Amazon warranty, provided by Asurion, LLC. 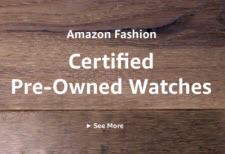 - For watches designated as Certified Pre-owned and sold by sellers authorized to sell Certified Pre-owned watches on Amazon, customers will receive a one-year limited warranty, provided by WatchFacts. As for warranties for watches through eBay Authenticate, each eBay seller offers their own warranty plan. Shoppers can find pre-owned luxury watches on other sites, of course, including jewelry stores that may be authorized by brands like Rolex. (Tourneau comes up high on Google search results). But when it comes to the ecommerce giants, eBay may find itself increasingly competing with Amazon in pre-owned categories, if Amazon's luxury watch program is any indication. Do you think eBay has anything to fear? What category do you think Amazon might eye next when it comes to certified pre-owned items? Amazon as usual gets our money. I have access to both NEW and Pre-Owned watches like this. At this time, I NEVER list watches of significant value on either platform due to high fraud aka fake returns - where the buyer switches his "anything" for a high priced item and then swears that that was what he got. eBays reputation isnt much better then Amazons (if at all) in backing up sellers (though Im sure that Tourneau as a beloved gets special protection) when fraud arrises. Good luck to anyone stupid enough to sell items like this - if they dont have a plan B when issues arise (and they will). eBay has a lot to fear. The more customers Amazon lures away from eBay, the more desperate eBay will become, thus raising fees or instituting new policies that will guarantee a flow of money. What that will accomplish is more sellers either moving to Amazon, or other marketplaces or their own web site. At this stage in Amazon's life. If they launched an auction site, ebay would be cast into the cess-pool where they belong. Begging sellers to come back with their disingenuous corporate babble. I would buy such from neither eBay nor Amazon. In person at a reputable store only. Talk about taking a chance on a crap shoot -- both places, tho I guess Amazon may be a very little less dangerous. Another nail in eBay's coffin. It's like unintended consequences. Careful who you copy. "Hey ebay...you like apples? How 'bout dem apples?" Right. It's called a virtually compulsory requirement to accept a seller paid return ship cost fully refunded return up to six months after completing the transaction whereby the registered as a business watchmaker buyer can swap out the guts of an proven and documented authentic vintage $4500 Rolex with junk off his workbench and for which the seller has no recourse to rebut or recoup, no matter what incontrovertible proof of it all can be provided to eBay 'warranty'. If Amazopoly is not a bunch of greedy rats trying to kill every company I don't know what it is. I guess the same people cheering here how wonderful Amazopoly is, are the ones that don't believe in facts, climate change or dinosaurs. I wouldn't buy a luxury item from either site, I would go to a site like therealreal or luxury garage. Or they are people who have worked all their lives, Scrimped and saved, raised their kids and are no retire who have realized years ago its not worth the energy to care anymore. We will be dead long before any of your predictions come true. host - "If Amazopoly is not a bunch of greedy rats trying to kill every company I don't know what it is. I guess the same people cheering here how wonderful Amazopoly is, are the ones that don't believe in facts, climate change or dinosaurs." I can't afford $119 right now! if amazon started an auction site they would probably gate it and make it impossible for the average person to sell on it.